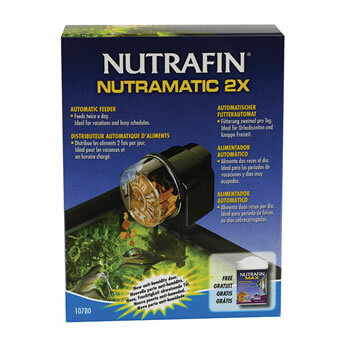 The Nutrafin NutraMatic 2X Automatic Fish Feeder feeds every 12 hours. This battery powered fish feeder has an easily accessible food drum. The NutraMatic 2X can be installed in 3 different positions: free standing, rim mountable and fits into certain canopies. The Nutrafin NutraMatic 2X Automatic Fish Feeder feeds every 12 hours. This battery powered fish feeder has an easily accessible food drum. The NutraMatic 2X can be installed in 3 different positions: free standing, rim mountable and fits into certain canopies. In addition, the amount of food dispensed from the drum can be adjusted and accepts most varieties of dry foods. The NutraMatic 2X is ideal for vacations and busy schedules.